Obviously too early to draw any conclusions regarding what will happen this year. That said, let us all take a moment to hope and pray for the best. JAXA still not showing the graphs and the data for 2018, so I had a look at the NSIDC daily data spreadsheet. This says extent on 4 Jan still 300 k km2 less than 4 Jan 2017, BUT extent stalled last year for a good few days from now. Welcome to the posting world, Frosty. As at 5 Jan extent still lowest, but now by only about 150 k.
NSIDC extent dropped quite a bit, pretty much removing yesterday's upward spike. 2017 extent barely grew over the second week of January, but shot upwards nearly a million km2 in the second half of the month. IOW, we can expect 2018 to fall into second place over the next day or two, and remain there until at least the 18th or so. Both GEFS and EPS ensembles are mostly in agreement on a synoptic setup that supports warm anomalies driven from subtropical advection on both the Atlantic and Pacific sides in the 5 day to 2 week mid range. On the Pacific, a return of strong -EPO conditions starting around 5 days out will support another round of anomalies on the Pacific side. In the Atlantic, a strong pressure gradient along the NAO will transport subtropical moisture over the Greenland and Barents seas. The 5 day cci-reanalyzer forecast also has both ends warming up. So the question is - will this warmth slow down extent gain as in 2017, allowing 2018 to keep in first place to mid-month and later in the month to become ridiculously lower than 2017 ? JAXA 2018 data and extent graphs still not available., so I sent a polite e-mail to the Japanese National Institute of Polar Research to ask when it may appear. Not sure. But I follow their Twitter feed, and they're normally pretty good about keeping up-to-date in regard to outages. But there's been no such tweet lately, so I assume they're just on break, maybe? The attached image, adapted form @zlabe, wraps up 2017 extent for the Chukchi. The definition of that sea is elusive, with boundary definitions varying widely by source. The inset shows a common choice that may be what NSIDC used for the data. Researchers at NSIDC often do not use this boundary in their journal articles, more often taking a contour line such as -150 m as the northern extent, which makes more oceanographic sense than a latitude line oblivious to bathymetric shelves and basins. It is also common to see no definition, simply Chukchi text floating conceptually north of the Bering Strait. The scale has been changed to percent of maximal possible extent as this is more to the point of seasonally ice-free. By pixel counts, 63% of maximal extent was realized over the year but only 44% over May-Dec and similarly over the insolation season. 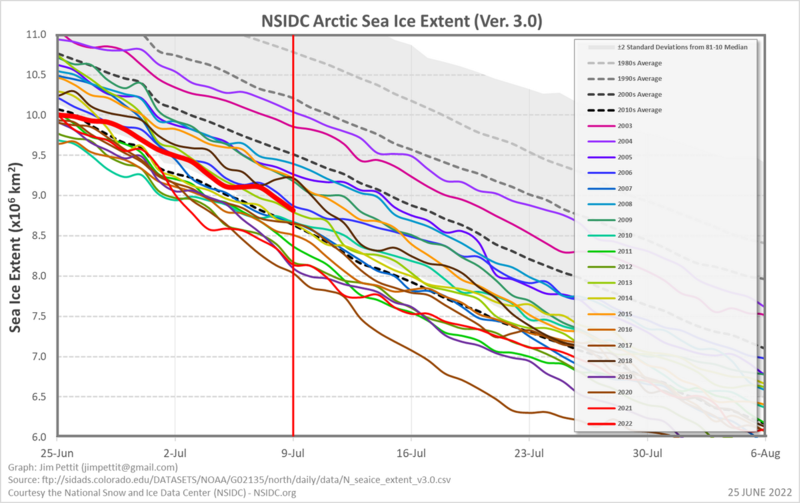 So we are about halfway there to 'seasonally ice extent-free' for the Chukchi and many of the consequences will have set in already. On the admin oddities front, it appears that "viewed n times" is not working today. Japan does well for National Holidays. Perhaps tomorrow may see some scientists and technicians stagger into work. Of course, record low winter extent doesn't mean record low summer extent (see: 2017). Our pathway now will mean that a poor summer for melt/export will still lead to the blue ocean event and then it will probably repeat thereafter with only exceptional years retaining the 'over the million' in ice cover all summer? That said I do see this as an ongoing change to summer weather over the basin as more heat/moisture becomes available so who knows what comes next? Last year at about this time, due to the slow 2017 extent gain in the Arctic, there was discussion about the relative importance of sea ice loss in summer and winter, especially given that the September extent minimum has been going down at about 12.5 % per decade while the March maximum only at about 2.5 % per decade. The question is - are we seeing an acceleration of winter extent loss ? If so, that leads to the question as to the relative importance of the oceans and the atmosphere, and then to what does this mean for summer ice. Trouble is, I haven't the faintest idea of how to answer any of these questions. I still think in March extent will be low, and I guess we have a good (or bad...) chance it will be a record again, but I think the polar night will be so cold for decades to come, and the ocean not warm enough, that the top layer will still freeze, but it will lack thickness. But it is just a gut feeling/ based on simple logic without thorough understanding of all mechanics. I had received an e-mail stating that something had been changed in the JAXA SIE data sheet, but now the ADS NIPR site can't be reached. Has anyone seen whether data had been updated? I know it's winter/hibernation time, but 10 days of no data is too much! I am encouraged that the site is now down - perhaps that means they are trying to fix the problem. Meanwhile, my spreadsheets are dying from data malnutrition. Hey-ho, we may still book passenger flights crossing arctic to get data . Remember tuesday updates on windows-machines may be a bit more tricky this time around. For sure, some of JAXA stuff runs on Linux, but will the updates talk to each other? 10 days of no data is too much! RASM_ESRL to resume its forecasts on 14 Feb 18. After a 50 day hiatus! No word on whether they will infill missing data days nor if algorithm is changing (and backwards-comparable). Possibly a good window to get in comments, feature requests and bug reports. Email contacts on web page. Life must be very difficult at NOAA at the moment - they still do not know how much they will be clobbered when the 2018 Federal Budget is decided. I understand that at the moment they are on 2017 pro-rata budget levels. Something might be decided at overall level in the next 10 days. Recently flew Tokyo to London and noticed that the plane did not cross into the Arctic despite it being the shortest route. so don’t go booking Arctic flights without checking if the plane goes there. is avoiding the Arctic normal practice for commercial jets? Not in summer at least, i don't know of winters... Could of course be a matter of jet streams, the airlines like to use'em to save in fuel. Flying counterclockwise this might be more of an issue. Definitely if you can get in the jet stream uses a lot less fuel and saves time, similarly if flying from London to NY you'd want to avoid it. Well Jaxa is up and running again. Jim Petit wrote back in #637 of 2017: I spend a few daysof the new year tweaking all my graphs and charts. I've read the suggestions for changing the baselines and so on; any changes incorporating those suggestions will be made public in early January. @zlabe linked to the definitive meteorological article used to justify climate baseline definitions, anomaly charts, and what to do during periods of rapidly changing baselines, first article below. It has been cited 131 times; I chased through those to find the best five, all free full text. JAXA DATA AS AT 9 JAN 2018. Hoorah.. Although extent loss gain on average is 85% done, there is on average 66 days to go to maximum. Extent is still just lowest in the satellite record. Historical data suggests a low or record low maximum, but over the last 10 years maximum has been reached any time from the 2nd to 31st March. cci-reanalyzer forecasts high temp anomalies in the Arctic for the next five days, especially at both ends (Pacific and Atlantic) , weather-forecast.com shows a big push of wind from the South into the far north Atlantic this week and continuing stormy weather in the Bering Sea. Slow or zero extent gain over the next few days ? I'm trying to post my first image! It's the count of days for each year with the lowest JAXA (or NIPR or VISHOP) extent number for its date. 2018 has 11 first places finishes in 11 days. It looks like it will probably move to second for the next couple of days, then maybe get first place back. JAXA DATA AS AT 12 JAN 2018. Hoorah.. Extent gain on average is 86% done, there is on average 62 days to go to maximum. Extent is still just lowest in the satellite record, and as commented above, is likely to be second on the 13th for a couple of days, and then possibly to be lowest again. Historical data still strongly suggests a low or record low maximum. We will see. JAXA extent at 14 Jan now 90K km2 greater than 2017. This could easily change over the next week, as the graph indicates. A record low remains on the cards. The third biggest January increase in the JAXA record has 2018 leaping by over 151K putting it well behind 2017 for the moment but still comfortably in second place. 2006 is now the big challenger as it takes over as lowest on record on the 19th for 8 days. 150k increase immediately followed by 34 kn and 11k. Result ? No real change. 2018 is lowest again by nearly 170 k km2, representing about 4 days average extent gain at this time. The average remaining extent gain is about 1.1 million km2, ranging from 0.7 to 1.5 mllion km2 in the previous 10 years. The historical data points more strongly to a record low maximum. Another small decline on the 21st puts 2018 almost 120K km^2 below 2006. 2006 jumped 200K in the next 2 days not quite catching 2017 and is the lowest on record for the next 5 days. 2018 will need significant increases over the next five days if it is to lose first place anytime soon. Just a 4K extent increase, meaning 2018 now 317 K km2 less than 2017 (circa 8 days average extent gain). If remaining extent gain was average, the maximum would be 13.72 million km2, some 160 k less than the record low of 2017. However, on average about 50 days and 1 million km2 extent gain to go, so.. who knows. The image shows extent for all years since 1979, the colours reflect the passage of time from top to bottom. JAXA had a daily increase of only 36.5K km2. To match 2006, it has to increase 232K km2 in 2 days. I do not think it will happen. After the 25th, the year 2006 had important extent increases. So 2018 will stay being the lowest on record. After the 25th, the competition will be with 2016 and 2017. JAXA says an An 80 k extent increase on the 24th and a 37k increase on the 23rd , while NSIDC says a similar 80 k increase on the 24th but a 150 k increase on the 23rd . The next 50 days will tell us if a record low will happen.But 2018 has already written a line on the graph below any previous year. 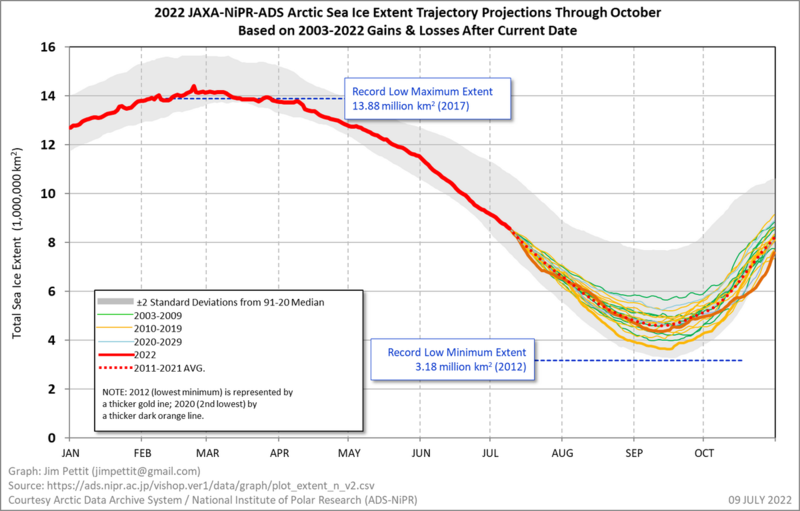 I find it curious that the Pettit JAXA Arctic Extent projection available on the ASI Graphs page (reproduced below) is not obviously available on Jim Pettit's linked website. I note that based on previous year's actual increases from this date (actually, yesterday), a new record low ASI maximum will likely be attained (but not by following 2012's increase). Also, not only 2012-styled sea ice net loss but also 2016 mimicking net loss will cause a record or near-record September minimum. I find myself increasingly leaning towards using running 5 year averages for net losses/gains when making these comparisons. My hunch is they will better reflect the more recent trend. In this case, the longer trend incorporates larger increases and losses than have been typical the last few years, and I think weigh the averages in ways that aren't really reflective of the changing conditions. I'm for me to dust off my spreadsheets, download some SIE/SIA data and crunch numbers again. We will quite likely get a near-record or a record, but I'd like to point out that a major reason for the record low extent in the fall and early winter comes from delayed refreeze, rather than avoided refreeze. This can easily be seen in the Chukchi where the ice-free season is longer by about 2 months compared to even a few years ago, but extent still reaches the maximum possible in the dead of winter. Some peripheral seas do have areas that may avoid refreeze (especially Bering and Barents, also Baffin and the mostly irrelevant but volatile Okhotsk), and that is where the record is decided. What I am finding interesting in the estimate of the increase to maximum is the way that the linear trend line over the past fortnight has moved from showing almost no change since 2003 to showing a significant decline of about 250,000 km^2 currently. Each of the past three years have been impacted by the El Nino, producing warmer Pacific water and have very low increases from yesterday to the max. Meanwhile 2012 may have been impacted by the 2010-12 La Nina, and cooler water, causing greater than normal increases. Pacific waters are again warmer this year and I am not expecting a lot of sea ice to form in that area. What I find to be interesting is that much of the sea ice extent is seasonal ice, so much of the gain's that we've seen this year will disappear shortly into the warming season. i'd be more interested in knowing the thickness of the perennial sea ice that remains at the end of the summer. You'll find a graph here that shows you that. By mid summer the remaining ice is around 1m thick obviously by ow it wil have thickened up to 2-3 m, but that is an average. Some will be thicker than that. Are those graphs updated automatically if I just refresh that website every month or so? Good-o, Mr Pettit, I bookmarked you some time ago. JAXA ARCTIC DATA at 25 January. Extent up a modest 13k km2, Extent is 12,813,943 km2, some 400k below 2017 and 140k below 2006. 2018 continues to plough its lonely furrow across the graph. I also had a look at annual averages for recent years - just to see the decline over time. Many of the graphs are linked to the source data and most are updated regularly. They are definitely a good source of information.